I've brewed a surprising number of beers with ingredients grown on our .1 acres of Washington, DC. Including hops, cherries, juniper, ground ivy, mulberries... and recently fermented acorns! Rather than showcase a single ingredient though, I wanted to brew an estate beer with five ingredients grown and harvested on our land! 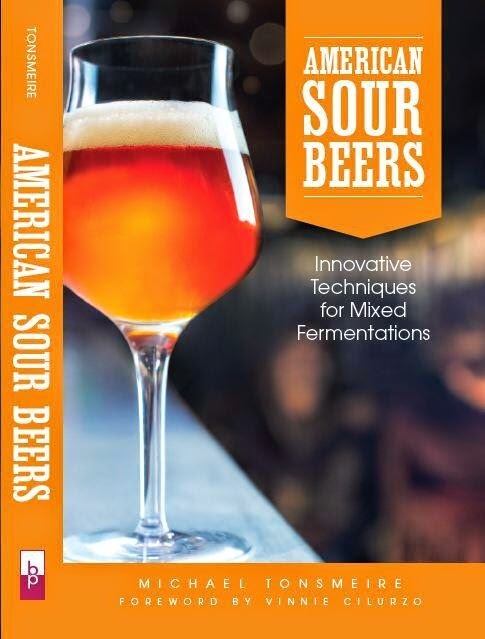 The extent of the influence of aged hops on sour beer is still a bit underestimated. 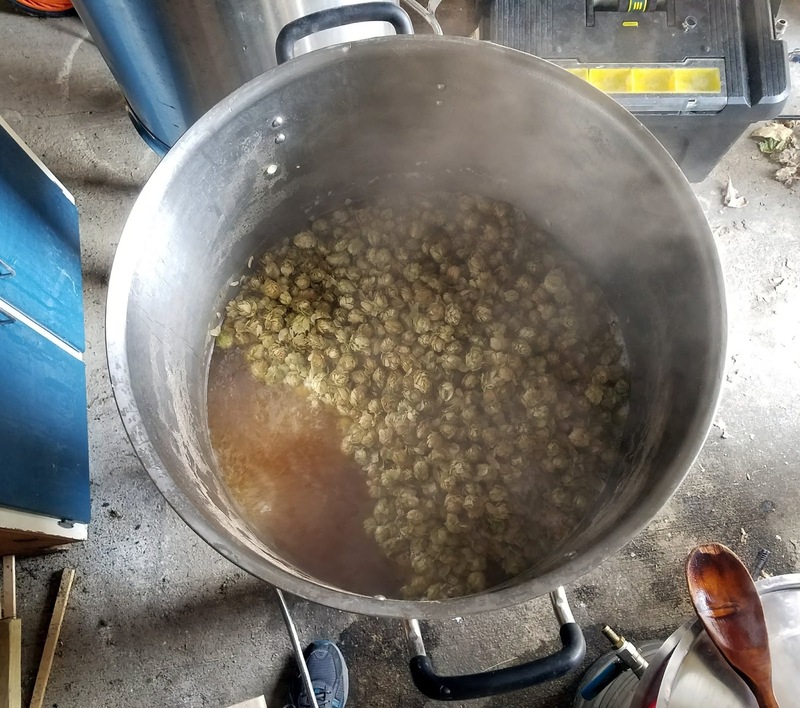 While the generally stated goal is preventing rapid souring by Lactobacillus in a traditionally fermented lambic, what they add to the flavor and what particular characteristics of the hops best serve this isn't widely studied. There are a few studies that oxidation can boost certain fruity aromatics. Which has lead Scott to threaten to use old hops on the hot-side for a NEIPA... he promised to do a test batch before brewing a 10 bbl batch on the new Sapwood Cellars brewhouse. I thought it would be fun to brew with aged Cascades from the bines in my backyard, especially because fresh they didn't have a huge aroma. They'd been sitting open in my basement since they were dried a few years before. 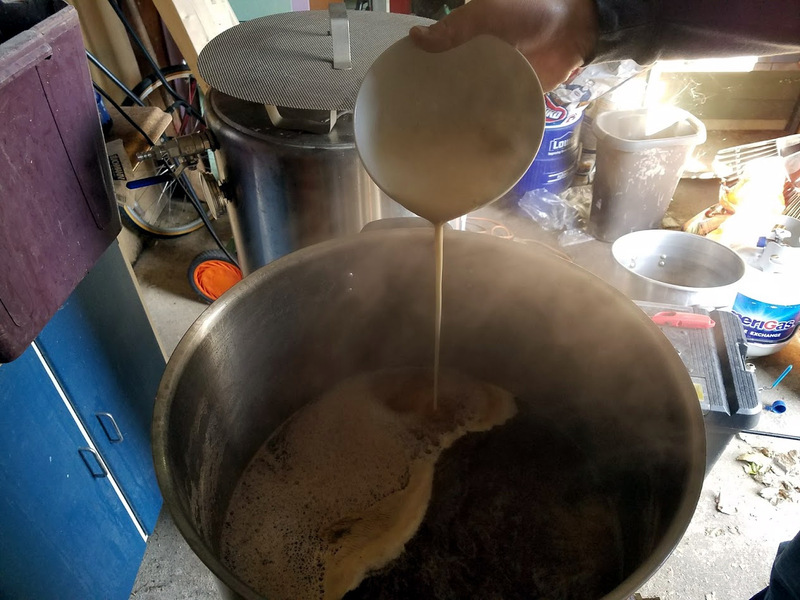 I don't have the space or effort to grow or malt grain, so I took the easy way out and brewed with wheat malt extract (a blend of 65% wheat malt 35% barley). I'd had good results from extract lambics previously, but this time in addition to maltodextrin I added wheat flour slurry to the boil. Mixing the flour with cold water prevents it from clumping when it touches the boiling wort. A turbid mash pulls starch from the unmalted wheat into the boil, which eventually feeds the various microbes in the late-stages of fermentation. The microbes must have enjoyed it as the resulting beers are completely clear. Fruit was provided by our four berry trees/bushes. Sour cherry, blackberry, raspberry, and mulberry. To keep things easy I added roughly equal amount of each (other than the raspberries). I briefly froze most of the fruit, but I added the raspberries a small handful at a time as they ripen slower than the rest. I only had enough of each for one gallon of beer, as most of the rest of the fruit was spoken for. The leftover beer went onto local plums! Smell – Cherry and raspberry lead, not surprising as they are more distinct than the blackberry and mulberry. There is an underlining wine-iness that likely comes from the rest of the fruit. The base beer behind the fruit doesn't make itself known other than a subtle maltiness. Appearance – Clear garnet on the first pour, a little haze when I emptied the bottle into the glass. Alright head retention thanks to the wheat. Taste – Reminds of the nose with raspberry up front and cherry jam into the finish. Not as bright and fresh as it once was, but still reasonably fresh. The malt and hops don’t add a huge amount of character, but they support the fruit. The Wyeast lambic blend similarly stays mostly out of the way, adding edge complexity without trying to fight through the fruit. Mouthfeel – Not a thick beer given the relatively low OG, and all of the simple sugars from the fruit. Solid carbonation, CBC-1 did a good job despite the acidity. Drinkability & Notes – The combination of four berries works surprisingly well to my palate. They play together without becoming generic fruitiness. The base beer is unremarkable, but that’s fine in a beer where the fruit is the star. Changes for Next Time – Would be nice to brew more than a gallon, but otherwise my only real changes would be to go all-grain. The rest of the batch went onto a two varieties of local plums. I've brewed with plums before in a dubbel. I wasn't sure about plums in a pale beer, but after trying spectacular examples from Tilquin and Casey I was convinced! Smell – Clear it isn’t a kettle-soured fruit-bomb, lots of lemon pith and mineral along with the moderate fruit contribution. Plums aren’t nearly as aromatic as the more common sour beer fruits, but they add a depth without covering up the base beer. Appearance – Beer is more rusty-gold than purple. Clear despite the flour. Thin white head, but this bottle appears less carbonated than the last few I’ve opened. Taste – Tangy plum skin, apricot, and lemon. Beautiful blend of fruit and beer. Wyeast Lambic Blend with dreg-augmentation again does a really nice job. Strong lactic acid without any vinegar or nail polish. Finish is moderate funk, hay, and overripe stone fruit. Mouthfeel – Light, but not thin. Carbonation is too low, maybe the cap-job on this one wasn’t perfect. Drinkability & Notes – Delicious. The plum could be a little juicier and fresher, but it works well. Sad I didn’t leave any of this half unfruited for comparison. Changes for Next Time – I’d like to keep experimenting with other plum varieties in beer. Glad the pale base worked out well. Despite “plum” being a common descriptor for darker Belgians, actual plums don’t shine with all of that malt. Hops were homegrown and aged open over several years. Fermented and aged in 6 gallon BetterBottle without transfering. Added some various dregs over the course of fermentation. 7/21/17 Filled a 1 gallon jug with the Wyeast half onto 6 oz each homegrown sour cherries, blackberries, and mulberries (plus maybe an ounce of raspberries - maybe 4 oz total over a couple months). The remainder went onto 3 lbs of methly plums. 12/14/17 Bottled the 2.75 gallons of the plum with 61 g of table sugar and rehydrated CBC-1. Bottled the .8 gallons of backyard fruit with 21 g of table sugar and CBC-1. It looks as though you just added the whole plums without slicing them, is that right? If so, did the plums break down enough for the flesh to get exposed to the microbes? The methly plums were so small that I simply froze them and then thawed in the fermentor before racking beer in. That create ice crystals that split the skin and allow easy access to the interior. Honestly don't remember what I did for the Castletons... but likely either sliced or froze. This looks like a delicious beer! I love the idea of a truly local beer. Would you share your percentages of wheat flour vs. malt extract? I'm fascinated in this idea of replicating a turbid mash with an extract recipe. Many thanks for all the work you do on this site. All of the recipe details are towards the bottom of the post! Cheers!